The anticipation of visiting the fabled pink city of palaces and exotic bazaars was overtaken by the child-like excitement of travelling in a train for the first time in three decades. 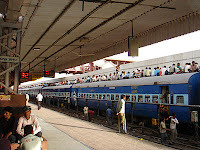 On a warm April morning, I was waiting at Delhi Railway Station to board the Shatabdi Express. As the train slid aside the platform, passengers promptly shuffled on board; five minutes later it was speeding out of Delhi. The pleasant initial impression at the railway station was soon blighted by the sight of a vast garbage dump that ran for miles and miles on both sides of the track. There was no consternation as pigs and dogs rummaged about while trains whistled past. Mercifully, the rustic charm of the countryside gradually started to transform the scene that seemed so familiar; one could well be travelling somewhere in our own Sindh or Punjab. 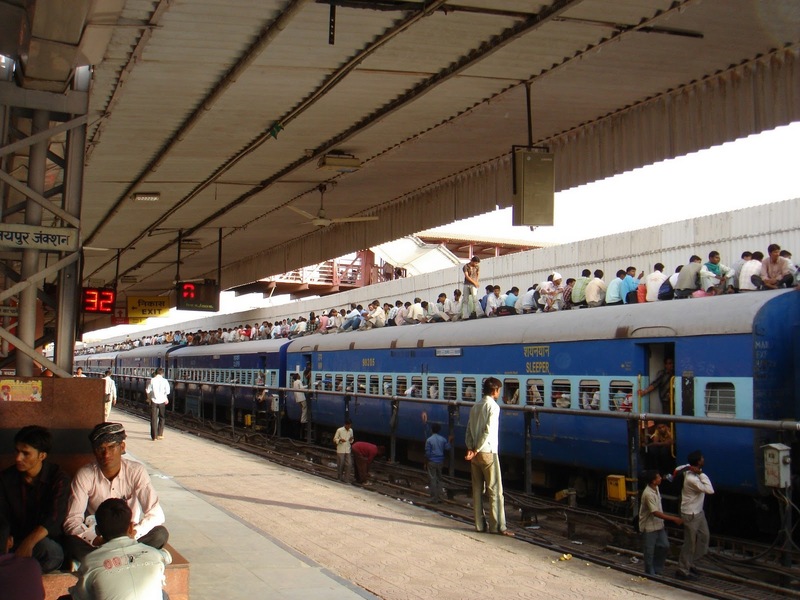 For me, the train ride was especially thrilling, as I thought there was no better mode of travel to study the land and people of India. Most of the passengers seemed to be well-heeled as the Shatabdi tickets are a bit dear. The money was well-spent, however, as everything was good about the train: the compartments were clean, seating was comfortable, newspapers and magazines were plenty, the food was a delight for a vegetarian like me and, not the least, the hostesses were most courteous and smart. I must also add that the train driver was an absolute stickler for punctuality, an attribute little cared for in our part of the world. Four hours later, I was at Jaipur. As I got off, two trains stopped by in quick succession, with as many passengers on the roof tops as were inside the compartments. “Such a sight is common on weekends due to rush,” explained a polite taxi driver who drove me from the station to the Narain Niwas Palace where I had a reservation. The high sounding palace is actually a ‘heritage’ hotel now, as most of the former rulers of India’s Princely States have converted their palaces into attractive tourist dwellings. These earn them sizeable revenues which help keep up their princely airs, while the government gets a good return from the thriving tourist trade. After a quick snack at a nearby Subway joint, I took a taxi that dropped me at a place called Bara Chaupar (Big Square) on the eastern end of the pink city. I may add that the pink colour of the buildings has an amusing history behind it. 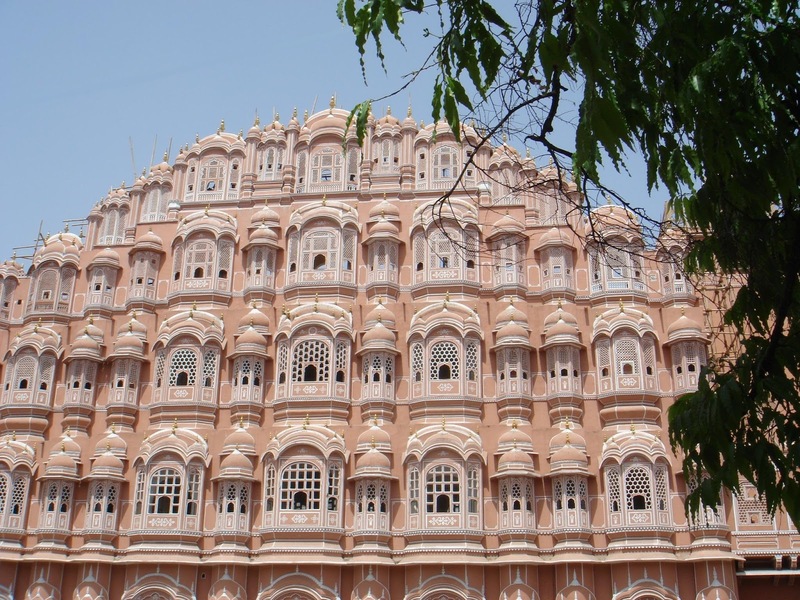 In preparation for the Prince of Wales’ visit in 1853, the Maharaja decided to impress his colonial benefactors and whimsically decided to paint all buildings of the city pink. (That should be known as ‘going pink with kindness!’) Nine blocks of buildings, including the City Palace and the Jantar Mantar Observatory, constitute the original city that was started by Maharaja Sawai Jai Singh II in 1727, and completed six years later. The well laid out city with wide streets is said to be the first in the sub-continent based on a proper grid plan, after a break of well over four thousand years since Harappa and Moenjodaro saw their glory days. All kinds of wares are sold in the bazaars, including textiles, jewellery, flowers, local handicrafts, etc. Curiously, I saw several female cobblers doing their work by the road side. 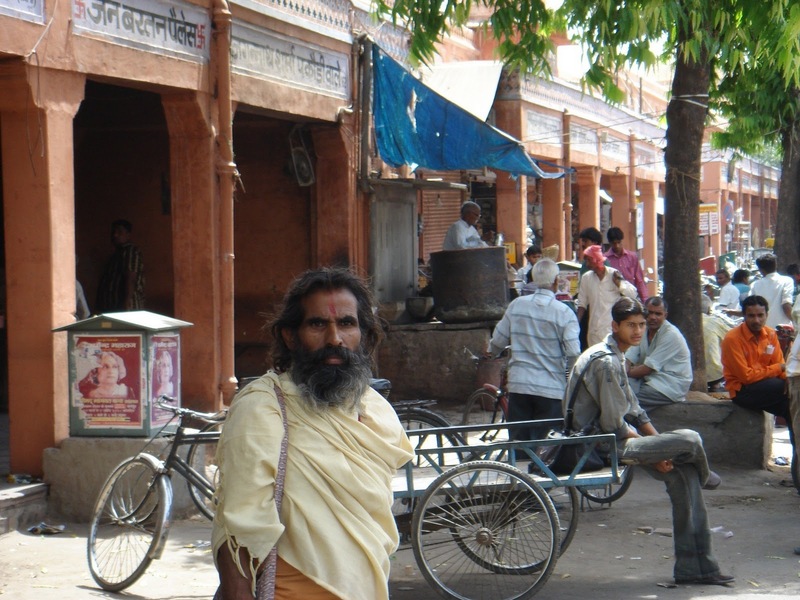 Sadhus and yogis were a common sight on the streets. The imposing Jamia Masjid near Bara Chaupar is a triple-storey structure with fifteen arched entrances. 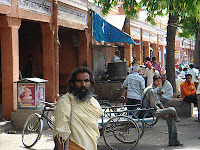 A sizeable Muslim population of the city lives in harmony with the rest, mostly Hindus. The main thoroughfare of the city is named after one of the most accomplished Prime Ministers (Diwan) of Jaipur State, Sir Mirza Ismail. 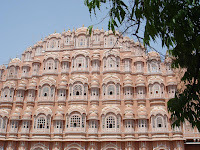 On the other side of Bara Chaupar is the famous fantasy structure known as Hawa Mahal (Palace of Breeze) built in 1799 as an extension of the Maharaja’s City Palace. According to one tradition, it was designed to let the royal ladies witness the market scene through the small windows and filigree screens, while remaining in purdah. The façade is supposed to represent the crown of the Hindu god Krishna, to whom the builder of this palace, Maharaja Sawai Pratap Singh, was intensely devoted. As one walks down the Tripolia Bazaar (named after a triple-arched gateway to the palace compound), a prominent Islamic-style minaret catches one’s eye, but it is a surprise to find that there is no corresponding mosque. It is actually Ishwar Tower, built as a victory memorial by one of the maharajas after defeating his step brother. The association of Kachwaha Rajput rulers of Jaipur (and previously Amber) with the Mughals is well known and, one sees this most vividly in architecture, where Islamic elements are clearly evident. Interestingly, the title of ‘Sawai’ was given by Emperor Aurangzeb to his unusual Hindu ally, Jai Singh II, for being extraordinary or ‘more than one’ against the Marathas, sawa (one-and-a-quarter) being used as a metaphor. The Maharaja’s heirs seem to have taken the title too literally, for they fly two Indian flags atop the City Palace, a full-sized one and a smaller, quarter the size of the bigger one. Old habits die hard, they say! After a busy day, I retired to the hotel for a brief rest. The evening fare at the hotel consisted of an open air dinner in a lovely mango garden, with a Rajasthani folk dance and music troupe in attendance. Next day, I started my tour with a visit to the City Palace, which is as old as the city of Jaipur itself. A portion of the palace, the Chandra Mahal, is occupied by the heirs of the last Maharaja, while the rest is open to public. I was welcomed to the Diwan-i-Khas (Hall of Private Audience) by two liveried guards with lances who were keen to help me with the camera. They suggested pictures with them as, “you will look like a Maharaja,” they uttered in unison. Of course they earned a good tip for the smooth talk. Located inside the Diwan are two silver urns, said to be the world’s biggest silver vessels, each weighing 750 lbs. When a former Maharaja visited England for King Edward’s coronation in 1901, these urns were shipped along, so that the Maharaja could drink ‘pure’ water from Ganga River and not be polluted by the English Thames. Ganga Mineral Water, anyone? Paucity of time demanded that I choose the Sileh Khana (armoury) over Mubarak Mahal where a boring display of textiles and crafts was underway. Some of the exotic items at the Sileh Khana included a dagger with two pistols on the sides, a disembowelling device whose many blades open up like an umbrella on penetration, daggers bejewelled with rubies and emeralds and, dual-purpose walking sticks that could shoot bullets. 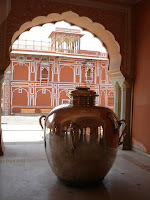 I came out awed by the opulence as well as gut-churning tastes of the Rajput royalty. A many-faceted Maharaja Jai Singh II had an interest in astronomy and mathematics as well, which led him to an observatory construction spree in five major cities. 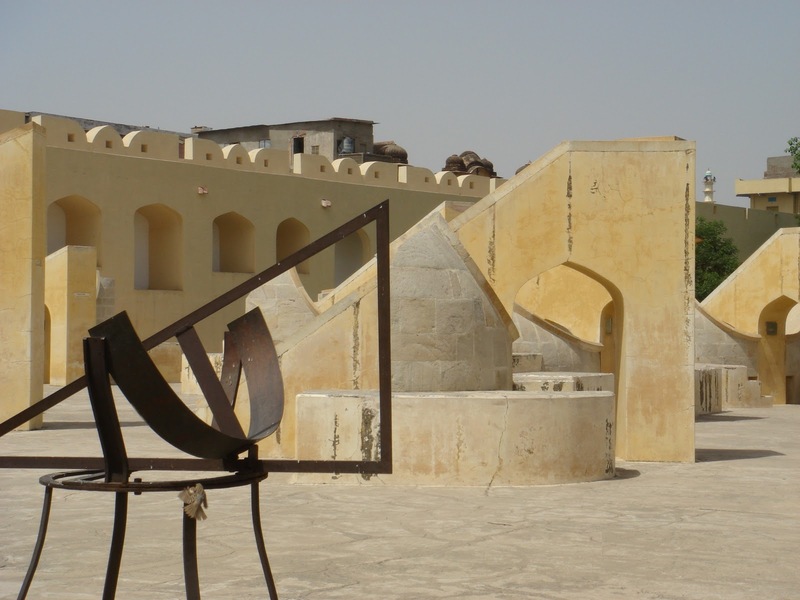 The one at Jaipur known as Jantar Mantar is a fully functional one, and has several structures including a huge sundial and devices for calculating the positions of heavenly bodies, as well as exact times of eclipses. It was amazing to see scores of children checking the time on the sundial, while many others were seen trying their skills at various other devices. I thought we needed an observatory in every district that could at least sort out our perennial moon sighting problem! After a short trip to the magnificent Amber Fort, I collected my night kit and checked out of the hotel. As the clerk handed me the bill, the manager soothingly came around to congratulate me for having lived like a Maharajah for a day! A late afternoon ride on the Shatabdi was uneventful except for some lively interaction with a fellow passenger. When I had declined a meat patty served over tea, he was quite pleased that I was a strict adherent of ‘the’ faith and hadn’t succumbed to modern ways. Then we discussed local politics, Delhi’s civic problems, world politics and just about everything under the sun. When he asked me what my profession was, I told him that I had been flying the fast stuff. “Oh, so you can take care of the neighbours!” To this one, I emphatically replied that I could. Despite conversing for hours I had managed not to give away my identity, but after his swipe, I was itching to let him know where I belonged. As we got off at Delhi Railway Station, he asked my address. When I told him I was from the neighbouring country, he nearly tripped off. He held his head in his hands and said it was amazing that in nearly four hours of conversation, not once did he think that I was an outsider. He was a businessman from Jaipur and invited me to visit again; he assured me that what he said earlier didn’t have much meaning to it. I thought I could do one better and warmly invited him to Lahore, “so I could take care of the neighbours!” We had a hearty laugh followed by effusive goodbyes, which brought a befitting end to a wonderful weekend at Jaipur. That was Emperor Jahangir recounting his hedonic capers in Tuzk-i-Jahangiri. He was taking a break at the delightful way station while on his way to Kabul in April 1607. Earlier, his father Emperor Akbar and later, his son Emperor Shah Jahan had been frequent visitors to this rest-and-recreation spot, where the watchwords were opium, wine, hunting and fishing. Today, the dilapidated relic known as Wah Gardens continues to be a relished picnic spot for locals and for whom, carbonated beverages and fowl-rich biryanis provide the ultimate high. I had visited the gardens several times when we were young students at the nearby Cadet College. For those of us whose parents were located too far for a weekend visit, cavorting in the local bazaars and verdant gardens of Hasanabdal provided welcome relief from chronic homesickness. Now, almost four decades later, nostalgia of another kind took me back to Hasanabdal. The aroma of spicy fried rohu fish sold by street side vendors, verdant loquat gardens even now too tempting for a mischievous raid, the all-pervasive whiff of bhang that grows ever so wild and, every other restaurant dedicated to Lalarukh, whoever she was: these were sights and smells that had to be savoured to relive those teenage years long gone. About three kilometres south of Hasanabdal near the small bridge over an anaemic Dhamrai Nala, a narrow road branches off into dense foliage. On the roadside is a romantic little cottage surrounded by a bamboo thicket, which I recall, was once owned by an old German lady. Winding around acute corners of villas of the well-to-do locals, one suddenly finds himself face to face with the ever-present extortionist, greedily waving the car parking coupon. The gardens seem abuzz with activity and revellers of all ages greet outsiders with the usual small town stare. A fifteen-rupee entrance ticket allows you inside the gardens. In the middle of the green lawns is the fish pond described by Jahangir, but instead of fish of the half gaz variety one sees dozens of mammals of the two-legged kind, clad in all-purpose shalwars, thrashing about in the water to kill the intense summer heat. Alongside, families have laid out their feasts on mats under the cool shade of some very old chinar trees. A nearby marble plaque proclaims: Chinar, Platanus orientalis, 1908. Besides the pond, the upper terrace also has a pair of utterly ruined baradaris, the only extant buildings in the gardens. Traces of an adjoining royal hammam (bath) are also visible. The lower terrace has a central water channel (now dry, of course) lined with elegant cypresses. At the north-western end of the channel is the main entrance gateway, which is closed to the public. “Time has left nothing but ruins of buildings, parterres covered with grass and weed-choked reservoirs, a jungle of trees….,” wrote a certain Colonel Cracroft in 1932. Today, eight decades later, it is not much different from the Colonel’s description. Unhappily, one is left wondering what the gardens must have been like in their original imperial splendour. For those of you who thought that something was amiss about Mughals on a rest and recreation trip, we shall move to another part of Hasanabdal to see if it connects. Turning into the Main Bazaar Street, one comes across the familiar Sikh Gurdwara of Punja Sahib. It is out of bounds for Pakistanis – which is no surprise, as things are – but that doesn’t matter if you are looking for a certain Lalarukh’s tomb that lies just across the street reeking with open drains and bubbling sewers. In the centre of a small chahar bagh style walled garden, stands an odd squarish structure made of rough stone blocks crudely plastered, standing about two metres high. 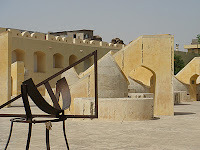 The somewhat stubby corner turrets of perimeter walls are topped by small ribbed domes, hinting at a Timurid tradition. A later day cenotaph surmounts the pedestal rather loftily; there is no tombstone, no sign of the forlorn occupant of this strange tomb. Lalarukh, or ‘tulip face’ is supposed to rest here according to lore, but her real identity remains an enduring mystery. Mughal genealogies or autobiographies do not record any princess by the name of Lalarukh. In any case, if she were a royal daughter accompanying the emperor and, died due to an accident or some natural cause, a splendid tomb would surely have been ordered. Could she have been a favourite concubine who accompanied the emperor as he tarried at Hasanabdal on his way to Kashmir or Kabul? Perhaps she contracted some tropical fever in the hereabouts and, was quietly laid to rest amidst the cypresses and cool streams, far away from the court chatter of Agra, Delhi or Lahore. On the other hand, she could well have been a local courtesan who knew how to liven up the emperor’s evenings with song and dance. As for the emperor who might have been associated with Lalarukh, all three mentioned earlier were consummate pleasure seekers; however, if the famous Anarkali offers a clue, it could well have been the unstoppable Jahangir! Just when it seemed that some headway had been made in this right royal tangle, we have one Hasan Gujjar who is claimed by traditionalists to be the real occupant of the mystery tomb. Why a Mughal emperor would edify the Gujjar’s resting place with a garden and a tomb and, not mention it in his autobiography when even the most mundane activity gets detailed, is inexplicable, unless one of the emperor’s nobles undertook the initiative on his own. One of our professors at the Cadet College, the late Mr M H Siddiqui, who was well-versed in local lore and history, was of the opinion that Hasan Gujjar was none other than the saintly Sheikh Karim-ud-din Baba Hasan Abdali. What is known for sure is that ‘Lalla Rookh’ is just a fictional character in Thomas Moore’s grotesquely amusing 19th century romantic poem, hung around the neck of Emperor Aurangzeb’s misnamed daughter. How she ends up in Hasanabdal, remains an unsolved riddle. Perhaps someone in the British Raj thought that Moore’s imaginary princess had just the right credentials to fill in for the unknown courtesan – or the Gujjar – and, could help attract odd tourists like me! Nearby, a well-designed but little cared for tomb known as Hakimon ka Maqbara stands derelict and decaying. 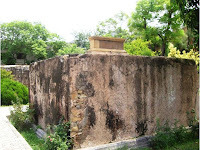 The tomb was constructed by Khawaja Shams-uddin Khawafi for himself in 1589. Khawafi was the Superintendent of Works during the construction of Attock Fort and had his summer headquarters at Hasanabdal. He was later elevated as the Governor of Lahore, but was not destined to be buried in his own tomb as Emperor Akbar ordered one of his favourite ‘Nauratans’ (Nine Jewels), Hakim Abul Fateh Gilani to be buried there instead. Subsequently, Abul Fateh’s brother, Hakim Hamam Gilani, was also interred in the same tomb. One suspects that Khawafi may have earned Akbar’s ire, possibly for trying to immortalise himself beyond what his station allowed. The tomb’s basic form is derived from a regular square with bevelled front corners. Archways on the four sides lead to the tomb chamber which is vaulted on the inside. The archways, as well as the exterior and interior walls, have niches which break the monotony of the simple structure. Unfortunately, crumbling plaster and graffiti scribbled through the ages have rendered this building in as wretched a state as the rest of the Mughal buildings in Hasanabdal – and much of Pakistan, I hasten to add. 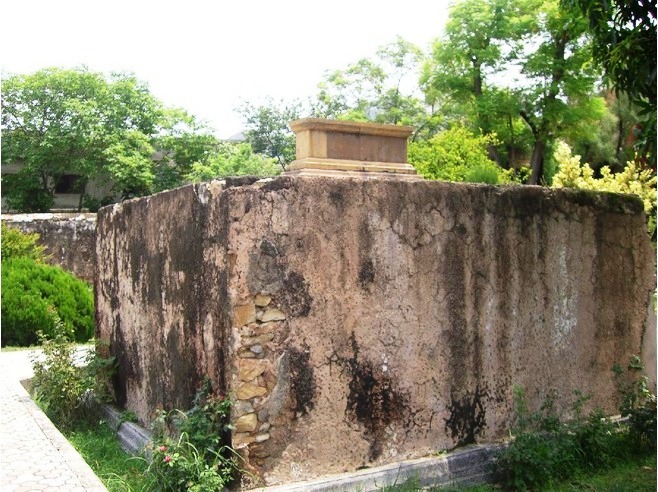 It is said that the ruinous condition of the tomb is largely due to the wanton destruction of Muslim buildings by the terrible Hari Singh Nalwa, Sikh Khalsa Army Commander and later Governor of Peshawar under Maharaja Ranjeet Singh. The cenotaphs of the Hakim brothers were razed, all embellishments removed and the tomb was used as a munshi’s office for a long time. Apparently, no worthwhile renovation has been undertaken since then. A fish pond in front of the Hakims’ tomb is full of slimy water with hideous flotsam, including polythene bags and juice packets, floating about. The wonder is that many large-sized mahasher fish swim about, apparently in good health! The next time the Archaeology Department decides to hold its annual seminar, Hasanabdal might be good venue to set up camp. Maybe it gets the archaeology mandarins’ attention for a long due repair job at this – once celebrated – way station of the Mughals. This article was published in the daily newspaper The News International on 2 October, 2011.